Henry Joseph Ellerbrock, Ship's Cook 2/c, born Dec. 23, 1914, Peru, IL, completed eighth grade at St. Joseph's Catholic School, and joined the service Sept. 18, 1940. He was stationed aboard the USS West Virginia and attended Fleet Machine Gun School. 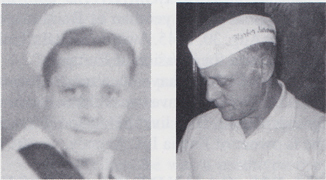 Discharged Nov. 23, 1946, with the rank of ship's cook 2/c. He is married and enjoys fishing.